Everytime I see something sailor related I always think of my other half aka my bestest friend Stephy Bb (Steph to you), I think its quite scary how psychic we are and we can normally tell what the other one is thinking. As its her birthday this month I thought I would dedicate this month's shoe to her. Ironically on nights out I always see Steph in sky high heels, yet she doesn't own a pair of wedges (or if she does I've never seen her out in them). 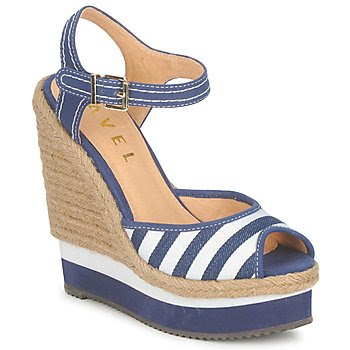 These Ravel wedges are a cross between a holiday/night out shoe and I actually think she would probably wear these on a night out. Personally I can never wear wedges :( don't know what it is about them, but for some reason they hate my feet and purposely cause me to fall over. I really should invest in a pair shouldn't I? ?